Hey all don't miss this event at Robinsons Department Store entitled: Barbie Play with Fashion Event on December 15, 2012 at the Mall Activity Area of Festival Supermall. 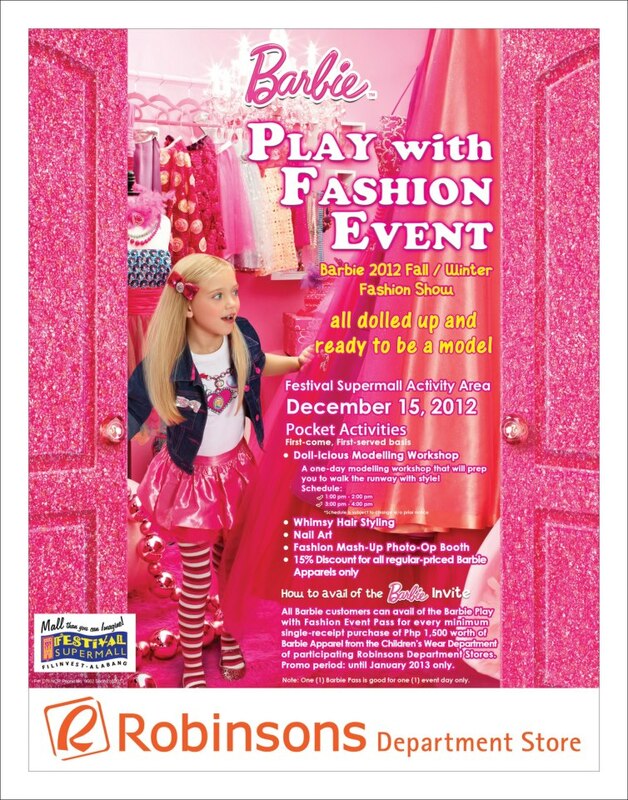 All you have to do is purchase P1,500 worth of Barbie Apparel regular items from participating Robinsons Department Stores from November 27 until December 15 and you'll get an exclusive event pass. The kids can join in the various workshops offered by Barbie Play with Fashion Event- Doll-icious Modelling workshops, Whimsy Hair styling, Nail Art, Fashion Mash-Up Photo booth and more!